A copyright lawsuit brought against “Big Bang Theory” producers, Warner Bros. and Chuck Lorre Productions has been dismissed by a New York City district judge. According to legal documents acquired by TheWrap on Tuesday, the plaintiffs Ellen Newlin Chase and Margaret Chase Perry failed to state a claim that a song written by their mother, Edith Newlin, featuring the line “soft kitty” had been inappropriately used on the CBS sitcom. Newlin, a nursery school teacher who wrote children’s poems and stories, penned the “Lyrics” in 1930 set to be published in a songbook by Laura Pendleton MacCarteney, the documents state. “Warm kitty, soft kitty, Little ball of fur, Sleepy kitty, happy kitty, Purr! Purr! Purr!” went the lyrics that were published in MacCarteney’s “Songs for the Nursery School,” which defendant The Willis Music Group (“Willis Music”) published in 1937. Eight decades later, the line “soft kitty, warm kitty” is periodically sung by the “Big Bang” characters to sooth physicist Sheldon Cooper (Jim Parsons). The initial complaint against the hit show was filed on Dec. 28, 2015, and the Amended Complaint was filed on March 14, 2016. Newlin, from Alstead, New Hampshire, died in 2004. 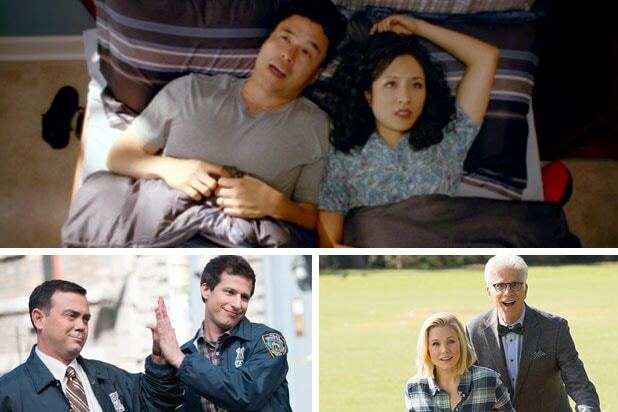 Click through our gallery to find out how all 28 broadcast network sitcoms rank and rate. All numbers in this slideshow are from Nielsen's "most current" metric, which counts one-week's worth of delayed viewing where available. Show: "The Big Bang Theory"
That's how things stack up -- for now. How could new midseason sitcoms like Fox's "The Mick," ABC's "Downward Dog" and NBC's "Marlon" shake the overall rankings up? We'll find out soon enough.